Ready or not, gamification is taking the business world by storm. For anyone unfamiliar with gamification, it's the application of game-like elements such as challenges, points, badges and levels to business and other nongame websites. An estimated 70 percent of the top 2,000 public companies in the world will have at least one gamified application by 2014, Stamford, Conn.-based research firm Gartner Inc. predicts. Patrick Salyer, CEO of gamification platform Gigya, believes there are two keys to success with gamification. "One is making sure that all gamified elements are inherently social," he says. "That is, don't restrict engagement to the internal site community. Award points for activities that reach users' social [networks] to bring in referral traffic." The other is to focus on rewarding activities that create value for your businesses. "For example, award points and badges for behaviors like subscribing to your company's newsletter, checking into your store or sending coupons to friends," Salyer says. "Gamification is not about haphazardly throwing badges across your site." Companies should weigh a number of factors before deciding whether to get into the gamification game. To help you decide, here are three case studies of major companies that benefited from incorporating gaming techniques into their sites and the lessons they learned along the way. 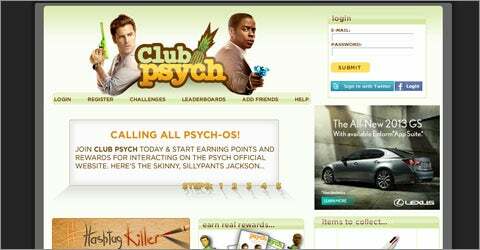 NBC Universal's USA Network enlisted the help of gamification startup San Jose, Calif.-based Bunchball in July 2010 to increase engagement on the website for Psych, one of its TV shows. First, they launched a fan loyalty program called Club Psych that lets users win weekly prizes by completing different challenges. To enhance Club Psych, USA launched Psych Vision, a mobile app that let users access behind-the-scenes videos, play trivia games to earn points and unlock prizes, and chat with other fans, all while watching the show. With this tie-in, USA became one of the first marketers to offer a complete second screen experience, where fans could experience Psych on their TVs, as well as via mobile. After seeing a 130 percent jump in page views and a 40 percent increase in return visits to the Psych website with the Club Psych integration, USA decided to expand and created a social media mystery game called #HashTagKiller, which engages fans with puzzles, clues and Facebook chats with the show's actors. Jesse Redniss, senior vice president of digital, says #HashTagKiller has driven more than 95 million page views from 300,000 unique users since its launch in September 2011. Lesson learned: Turn visitors into brand ambassadors. A gamified social experience such as Club Psych can turn engaged fans into valuable brand ambassadors. Redniss notes that, "288,000 shares on Facebook's platform have provided us with over 38 million exposures of the 'Psych' brand to our users' friends and families." To reward those ambassadors, USA Network has given away prizes such as Nintendo Wii systems, Psych DVDs and character bobbleheads. Verizon Wireless wanted to increase the time users spend on its website and the amount of interaction with its content. In January, the company partnered with Gigya and digital agency Modal to develop a new version of its community hub Verizon Insider. Now, users can earn points and rewards for participating in contests, posting comments and promoting events. Is Gamification the Right Play for Your Business? While gamification may sound appealing to companies seeking greater customer engagement, they should be sure it's a winning proposition before investing time and money. Dustin DiTommaso, the experience design director at design studio Mad*Pow suggests that companies think seriously about why they're interested in gamification and how it could help them meet their business goals. • What is the reason for gamifying your product or service? • How does it benefit users? • Will they enjoy it? • What are your business goals? • How do you get users to fulfill those business goals? • What actions do you want users to take? If you can provide solid answers to all the questions, gamification could be an effective component of your online efforts. Gamification can reward "behaviors consumers will naturally take on the site, such as sharing a blog that's relevant to their social networks or uploading a photo of themselves and their friends while attending a Verizon-sponsored concert," says Beth Tourek, Verizon's social media strategist. Verizon Insider also can be customized to match a user's interests or location. Verizon Insider seems to be paying off. "On average, users spend over 30 percent more time on-site with social login versus site login," Tourek says, "[And] the site has experienced more than 15 percent more page views." Lesson learned: Make it personal. Any gaming experience should aim to make users feel their experience is special. That's why Verizon Insider gives users customized badges to personalize their experience. "The gamification element that excited us most was the opportunity to create customized badges for unique local programs," Tourek says. "For example, we're working on a 'Snow Bunny' badge for people who enter an upcoming sweepstakes to win a season pass at a Utah ski resort we sponsor." Korean electronics giant Samsung launched its social loyalty program, Samsung Nation, in November to target the millions of fans who were already engaging with its corporate website. "We want to show them that we appreciate their loyalty and interest," says Esteban Contreras, social media marketing manager for Samsung Electronics America. 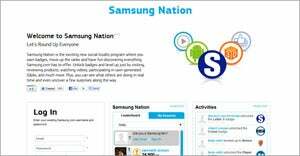 Samsung worked with Menlo Park, Calif.-based gamification company Badgeville to build Samsung Nation, where users earn badges for completing activities such as writing reviews, watching videos and participating in forums. Because Samsung.com already gets tens of millions of visits per year, the company didn't need to do much outside promotion. Instead, it has focused on explaining the benefits of its gaming program on its site. One of Samsung's gamification goals was increasing engagement and the number of product reviews. So far, results have been encouraging, with user behavior such as product reviews increasing "hundreds of percent per month," according to Badgeville. Lesson learned: Focus on engaged users. Instead of trying to reach a new audience, Contreras encourages businesses to focus on the people already engaging with their brands and figure out whether those highly engaged and passionate customers would value a social loyalty program. For Samsung, that meant learning how fans of Samsung.com were already using the site and how it could be made even more appealing.